No more waiting until Monday morning leak or clogged drain that happened over the weekend. Norwalk – La Mirada Plumbing has an on-call staff that will help ensure your home or office is back to normal as quickly as possible. No more being inconvenienced or risking health hazards to your family or your employees. 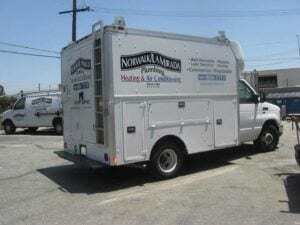 Let Norwalk – La Mirada Plumbing handle all your emergency plumbing in Norwalk, La Mirada, Whittier, Santa Fe Springs, La Habra, Downey, Cerritos and other parts of Southern California. Your heating and cooling systems can unfortunately also fail any time day or night. We understand this can be a huge burden, especially during the winter or summer months, and we know that you cannot wait until normal business hours to have them repaired. This is one of the reasons our expert HVAC technicians are available when you need them – 7 days a week, 24 hours a day! Contact us at any time and we will get one of our heating or air conditioning experts to your home or business. Do not wait until it is convenient for a plumber or heating specialist to show up on their schedule; our repair technicians understand when you need a repair it is an emergency that affects your home and your business. Norwalk – La Mirada has built our strong reputation on being available to our clients when they need us the most. You can rest assured that regardless of the emergency you are facing, you will get the same high quality and fairly priced service you have come to expect from our team.